← OMG I’m so sorry. Atmosphere matters terribly to the sensitive writer. For writing to happen, everything must be just so. Just so much light, preferably low in lamps, not too interrogating, not judgemental. Not dark and spooky. Just so much noise, preferably a blend of uninteresting chatter and music. Music must not be too catchy or loud, and maybe nothing from the ’80s, because I know all the words to every song that came out of the ’80s. Noise must find a snug corner in the subconscious and stay there, buzzing gently. I haven’t even gotten to the chairs and tables yet. Not to mention the coffee. 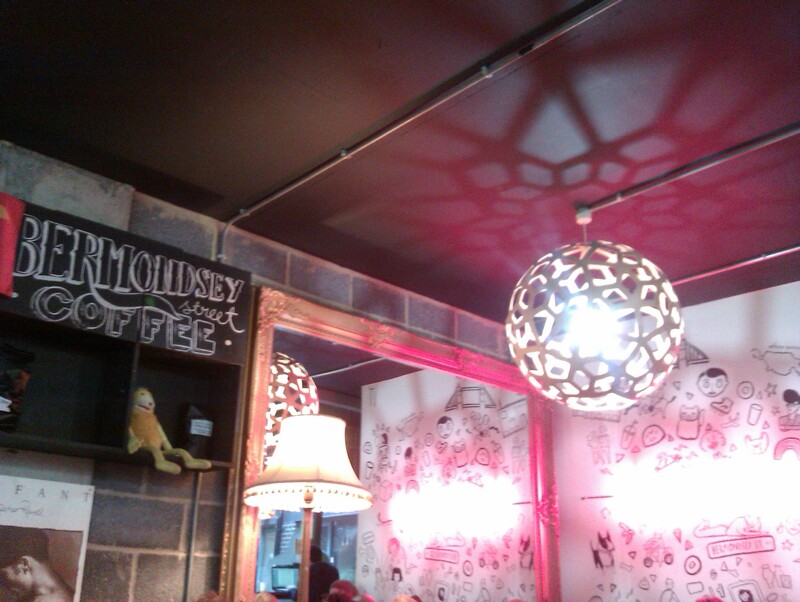 To be honest, I can forgive slightly less than terrific coffee for great atmosphere. I’m writing this from Bermondsey Street Coffee, which excels in coffee but not in atmosphere. I couldn’t write great things in here, I know this. This is one of those passing-the-time places. A place to surf the net, or write down some jumbly thoughts, maybe a blog entry. Nothing too serious or important. The chairs are great – comfy and leather, and arranged well for conversation and general chilling – but not for solitary pondering and writing. I can see too many people from where I sit. Artsy people. Reading people. Studying people. But mostly talking people. They move, they walk by, they distract and alarm the nervous birds of thought and idea that may wish to land in my head. They flitter away at the slightest provocation, these birds. The room throbs with music that is too carefully selected for ‘hip’ and ‘eclectic’ to fade into the background. Who can write great things with Michael Jackson singing in the room? Who can do that? This entry was posted in Restaurants and Cafés and tagged Bermondsey, coffee, restaurants and cafes. Bookmark the permalink.